Home > Shop By Brand > Lake Country Buffing Pads > Lake Country CCS Pads > Lake Country 5.5 Inch CCS Pads 12 Pack - Your Choice! Select twelve foam pads of the same size in the colors of your choice. You know what pads you need better than anyone. Customize your own perfect pad kit! This specially priced combo includes any twelve Lake Country CCS 5.5 Inch Foam Pads of your choosing for one price. You can choose all pads of one color or mix it up. Any combination is the same price. All the benefits of CCS Technology packed into low profile 5.5 inch pads. The CCS Smart Pads™ Dual Action 5.5 inch Professional Foam Pads are smaller versions of our 6.5 inch DA foam pads. The low profile 5.5 inch buffing pads pack the same CCS technology and performance into a compact, highly effective size that works best with dual action polishers and air sanders. CCS Smart Pads™ work on every type of paint, from conventional clear coats to the harder, scratch-resistant clear coats used by Mercedes Benz and the Ford Motor Company. 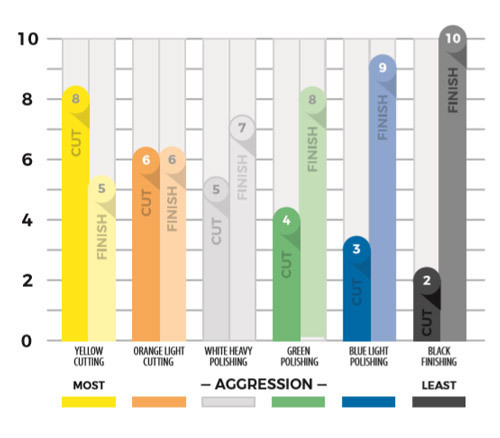 Lake Country's range of foam compositions, combined with the right chemicals provides you with a prescription to correct almost any paint imperfection on any paint finish. These CCS Smart Pads 5.5 inch Professional Foam Pads give you maximum maneuverability on your dual action polisher. Large foam pads tend to bog down DA polishers. That’s why 6.5 inch pads are the recommended size, but we’ve streamlined the dual action buffing pad even more with the CCS Smart Pads™ Dual Action 5.5 inch Professional Foam Pads. These compact pads give the dual orbiting head even greater freedom of motion to help you work efficiently and effectively. Great pads. 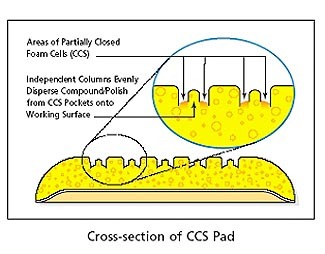 It seem as if my products I've used lasted longer due to the small pockets on the CCS pads. Only issue for me on the CCS pads was the small pocket where a bit more work to clean, I had to use a soft detail brush to remove some dry product. Overall well done! 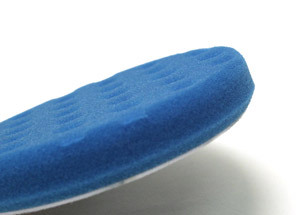 These foam pads are top of the line for performance and durability. Have used a few different brands and always come back to these. A company that truly understands what is needed for polishing and delivers that in their products. Don't hesitate to buy anything Lake Country offers.